Let the Forth Annual Adventures of Wiglaf & Mordred Pair-A-Thon Begin! See Below the Cut for more rules and information! Your goal? Either draw or write about your favorite pairing in Wiglaf & Mordred. I don’t care if it’s canon (ex. Geoffry & Janus, Horatio & Viola) or completely random (ex. Grace x Camlann showed up last year). If it’s what you ship – go for it. Just make sure to keep it clean and follow the rules! All entries will be posted on a separate ‘Entries’ Page (and I’ll link to this blog from the gallery page, too!) and will remain up indefinitely. So even if you don’t win – you still get a little attention! Also – just for kicks: The Mirrorverse and/or Genderbent Versions of the characters from the Ustream sketch sessions will be welcome if you’re so inclined. All entries must be in by February 7. At that point, a link to all entries will be posted on this blog post. On February 8 I’ll start accepting your votes for the winner! From February 8th to the 13th (10PM EST) I will be accepting votes via e-mail. More information when the voting process begins. Fanart and Fanfiction entries will be judged separately! So there will be a 1st, 2nd and 3rd place for both categories. 3. Keep it to couples (That means 2 people!). You’ve already got free range of pairing–let’s not make it too complicated by getting threesomes or foursomes involved. >.> However!! That doesn’t mean the picture is limited to 2 characters – you’re free to add extra characters reacting to the couple of choice in the background should you choose. 4. Up to 2 Entries per person. I realize a month is a long time and you might come up with something better down the line. So I’m allowing you two chances. 6. Pairings involving Hnæf or Safir MUST be rated G and non-romantic. They’re kids people and while I know that a certain pairing with Hnæf is rather popular (I’d imagine due to the fact his mentality is a lot older than 12) I’d rather not push my luck around here, okay? However! I will make an exception if it takes place in the future and Hnæf is 18 years or older in your drawing. That is all. 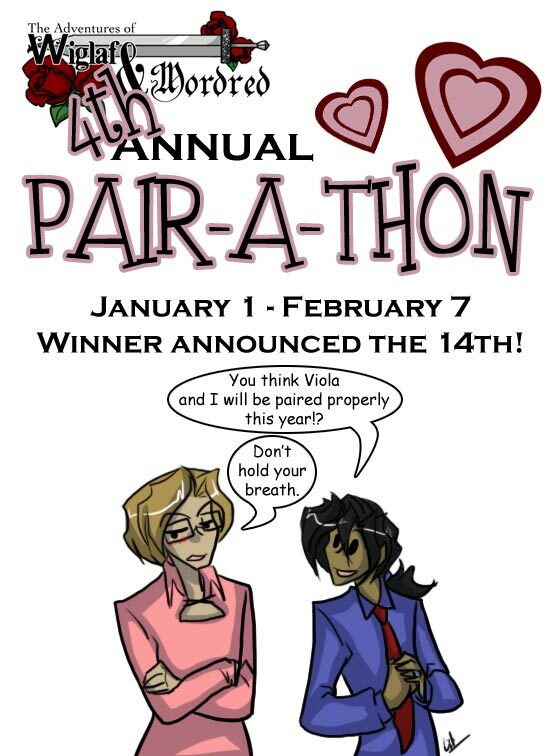 Send your entry to pairathon@wiglafandmordred.com ! Is breaking the forth wall allowed? I just thought I should let you know that on the Current Submissions page it says all entries are due by January 7th instead of February 7th. I entered something a couple of days ago, and I dont see it yet. I’m not sure if I got the email address right or if you haven’t got it yet. I just want to make sure you get it.